Kids break bones. It happens. Usually a child is in a cast for 6-8 weeks and good as new, right? Not necessarily so. 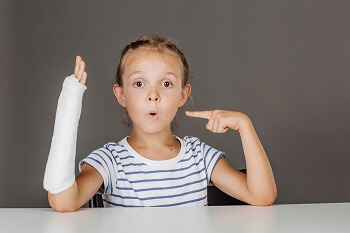 What do you as a parents need to know about "Growth Plate" fractures that happen to your child. Growth plates are active newer bone that is found near the "ends" of the bones. They have not yet fully hardened, and are made up of a rubbery type of cartilage. As your child develops, the growth plates harden into more solid bone. Girls bones usually harden earlier than boys, at age 13-15. Boys are about 2 years behind at 15-17 years old when their bones harden. So, what is a "Growth Plate Fracture?" This is a break in the rubbery cartilage like portion of the endplate of a bone. This is most frequent in bones of the fingers, wrist/forearm, and lower portions of the legs. Because they are softer areas of bone, they are easily injured. How Do Growth Plate Fractures Occur? Growth plate fractures can happen in any number of ways from trauma. Sledding, skateboarding, skiing, wakeboarding, innertubing, sledding, biking, playing football, basketball, etc., any of these can cause a fracture of your child's growth plate. These types of injuries can also occur from repetitive actions, such as training for gymnastics, pitching a baseball, and even riding a bike for long distances. X-rays may or may not reveal a growth plate fracture. Most of the time only splinting or casting is necessary, followed by rest of the extremity. If the bones are out of place, they have to be put back together in correct alignment by a procedure called a reduction. A closed reduction is moving the bones back into place without operating, or making any incision. The skin remains closed. An open reduction involves surgery, and possible plates, pins and/or screws. This is done under general anesthesia. The bones are then immobilized by a cast or splint with prolonged rest of the arm/leg. Most of the time the bones heal without any issues, even if they occur in the growth plate. However, sometimes the break results in a crooked bone, or crooked healing, thereby causing future problems and unexpected long term damage. One issue you need to be aware of is a condition known as "Growth Arrest." This is when the bone simply stops growing. This may result in one leg or arm being shorter than the other. One leg that is shorter than the other can then have residual problems, such as hip pain, lower back injury, and possible chronic resultant pain for life. If your child has a growth plate fracture at his knee, he is likely to get growth arrest or even crooked legs due to the additional damage to nerves and blood vessels in that area. In some instances, a growth plate fracture causes the bone to accelerate growth, which has the same result... unequal limbs. There can also be development of a ridge along the fracture line which can interfere with normal bond development and cause it to "curve." If the bone was breaking through the skin and becomes infected, the greater the likelihood of complication of the growth plate fracture. It is important that you stay in contact with your pediatric orthopedist and be on the lookout for abnormal growth, continued pain, curving of bones, "ridges" of growth that feel abnormal under the skin, and have regularly scheduled follow ups with your doctor.